areas to experience the region’s unique culture. The project involves painting quilt squares and murals of rural life on barns and other structures along the roadway. Each “quilt square patch” must be at least 8-feet by 8-feet…and that means you can’t miss them. 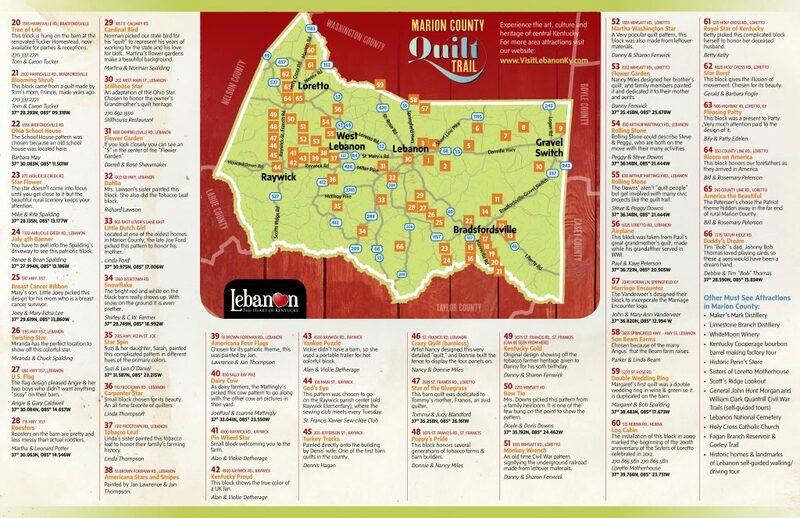 In the Heart of Kentucky the idea works great, because the Marion County Quilt Trail draws you into the wonderful, unique and colorful communities of Gravel Switch, Bradfordsville, Raywick, Loretto and more. And there are excellent places to dine and explore in each of those communities and along the way. Just remember, however: You are going to get to enjoy the wonderful experience of wandering country roads…some of them remote. We’re tried to make the experience easier to navigate with a free trail map you may pick up during normal business hours at the Lebanon Tourist & Convention Commission office. Or call the office at (270) 692-0021 and we’ll mail you one. 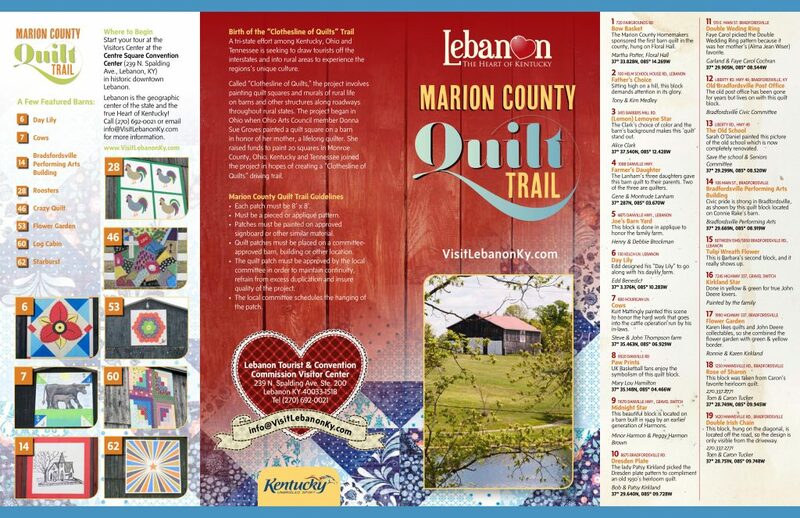 You’ll find that brochure reproduced on this page—as up-to-date as is possible—of all the existing spots on the Marion County Quilt Trail. Feel free to download it, or use it as a online guide resource. Enjoy the adventure of searching for each one. And don’t forget to take your camera!